Photograph submitted of the actual book discovered by the anonymous Black Vault user. In August and September of 2016, I received a letter from an anonymous book collector who came across a text from the 18th century. 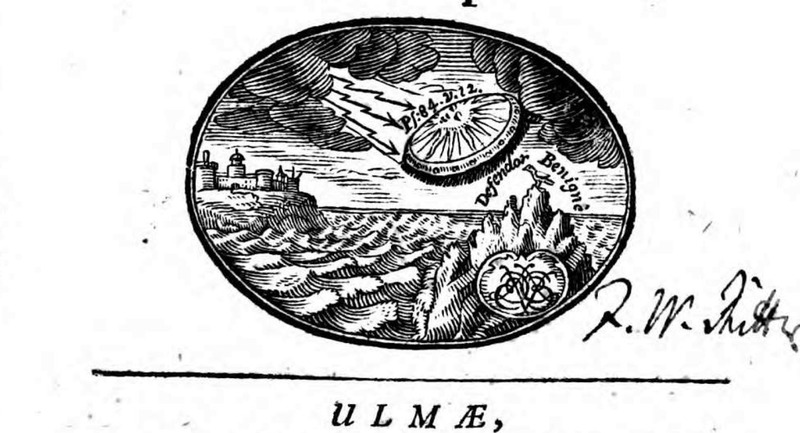 Published in 1716, this book clearly has a flying saucer shaped craft depicted in it’s cover art. Although I have been made well aware of many of the ancient and antique texts that have similar references, this one seemed new to me, and I was intrigued. I would prefer to remain anonymous but, that said, I can give you a little more information that makes this a riddle to be solved. Most of my skeptical friends dismissed this as a religious reference to the shield of God as quoted in Ps 84. But an associate who spoke Latin found a reference in the book that describes the sighting of a UFO in the classical saucer shape. I think this is important since there is a general dismissal of historical illustrations that are easily interpreted as some type of flying craft (Jung notwithstanding). The issue is that the passage was shown to me many decades ago before the internet and I have no way or will to research this any further. 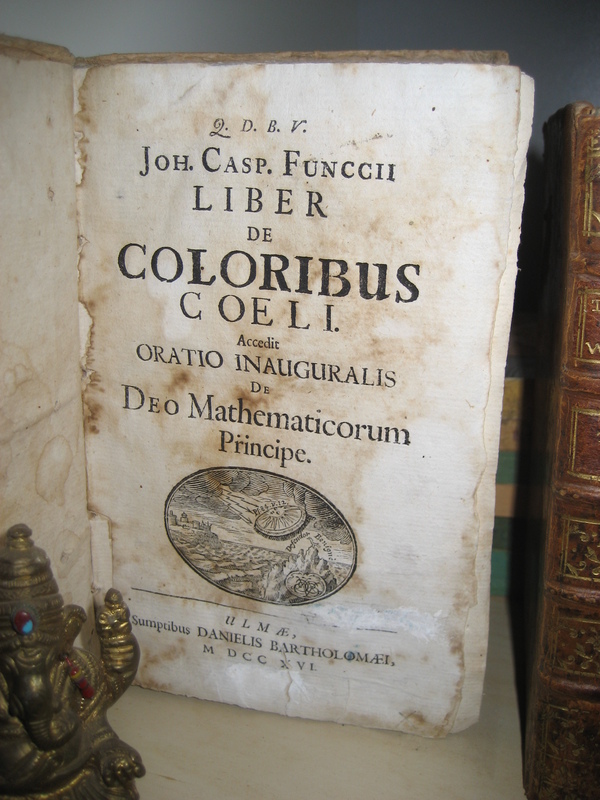 I am an ex antiquarian collector/dealer specializing in books on occult and science. I guard my privacy very carefully so I cannot participate any further than this. I am wondering if you could throw this out there and have some researcher dig into the volume and find the reference once again. I did see a scanned copy online with free access so I figured now was a good time to bring it up again. It was after hurricane Hugo took a swipe at Charleston in the late eighties. I survived as did my shop but many were less fortunate. There were quite a few antiquarian book dealers and collectors whose collections took damage. I made a good bit of business restoring books and ephemera and often, when a book was damaged, the owner would lose interest in it. They were usually a Roast Beef collector -an old derisive term the Brits used when selling decorative bindings to wealthy patrons looking for interior decoration. They would buy roast beef (an old volume of obscure poetry) for the price of a steak. I traded many rare volumes with bad bindings for worthless decorative books -assuming the bindings were dressed up with a good dose of mink oil and wax. Such was the case for the volume in question. The leather had been soaked and contaminated so it to be removed. The frontispiece itself still has water damage. When I opened the volume up, I almost lost my poker face. Fortunately, the owner thought it worthless even when new and gave it to me for fifteen dollars. I took this information, and did verify the book existed (and special thanks to them for finding me the digitized version of it linked below). 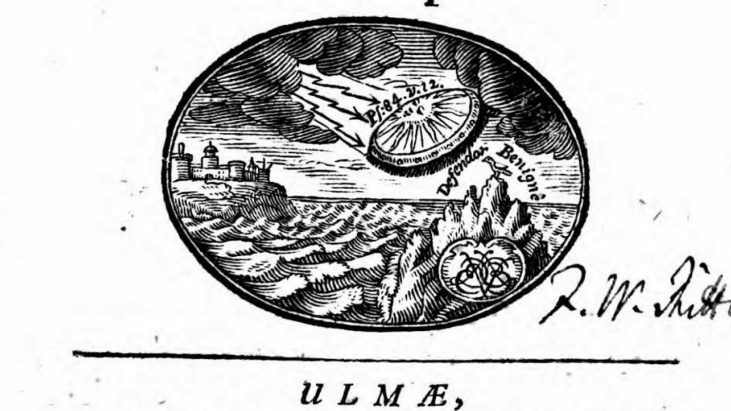 Searching the same library, for texts by the same author, I discovered that wasn’t the only depiction of a flying saucer published by this author. Author / Editor: Funcke, Johann Caspar ; Haeckhel, Christoph B. To anyone who can translate the texts, I welcome any submissions in the comments below. Post your thoughts and ideas — what do YOU think this mysterious object depicts? 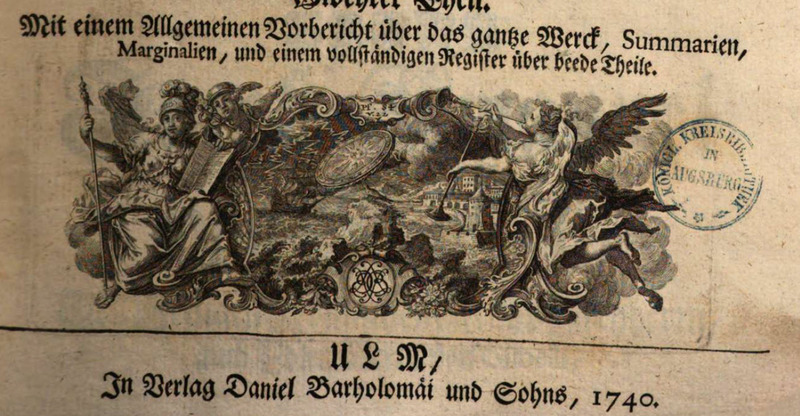 As a treasure trove of cultural heritage, a multimedia information service provider for scholarly research and as an innovative force in the field of digital services, the Bayerische Staatsbibliothek is one of the prime national and international addresses for researchers, students and all those seeking information. This puts it in an optimal position for rising to the challenges of the modern knowledge society. Founded in 1558 as court library of the house of Wittelsbach, the Bayerische Staatsbibliothek is one of the prime European universal libraries and of world renown as international research library. It forms Germany’s virtual national library together with the Staatsbibliothek zu Berlin (Berlin State Library) and the Deutsche Nationalbibliothek (German National Library) in Frankfurt and Leipzig. The Bayerische Staatsbibliothek is also the central state library and repository library of the Free State of Bavaria. With more than 10 million volumes, about 63,000 current periodicals in electronic or printed form and about 130,000 manuscripts the Bayerische Staatsbibliothek is one of the most important knowledge centres of the world. Every year approximately 160,000 volumes are added, which are selected and catalogued systematically according to scholarly criteria. The library’s unique collection profile is characterised by extremely precious manuscripts, rare printed books and comprehensive special collections from thousands of years of cultural heritage. But at the same time, the library rises to the challenges of the future: The Bayerische Staatsbibliothek is continuously enhancing its digital and Internet-based services, for example in the areas of electronic journals, mass digitisation of its collections and the development of innovative digitisation technologies. With one million digitised works, the Bayerische Staatsbibliothek holds the largest digital data stock of all German libraries. A large variety of services is offered in the field of innovative digital use scenarios.